Walt Disney World just announced that the new Wishes Fireworks Dessert Party reservations open today, and that got me flashing back to our AWESOME trip last year, where we made every evening a VIP experience, for Science. I mean, for the sake of making recommendations as a travel agent. I am not a fan of wasting time staking out a good spot for evening shows. I prefer to have someone "save me a seat", so to speak, so here are some of my favorite ways to do that! 1. My ALL TIME FAVORITE is the Pirates and Pals Fireworks Voyage. 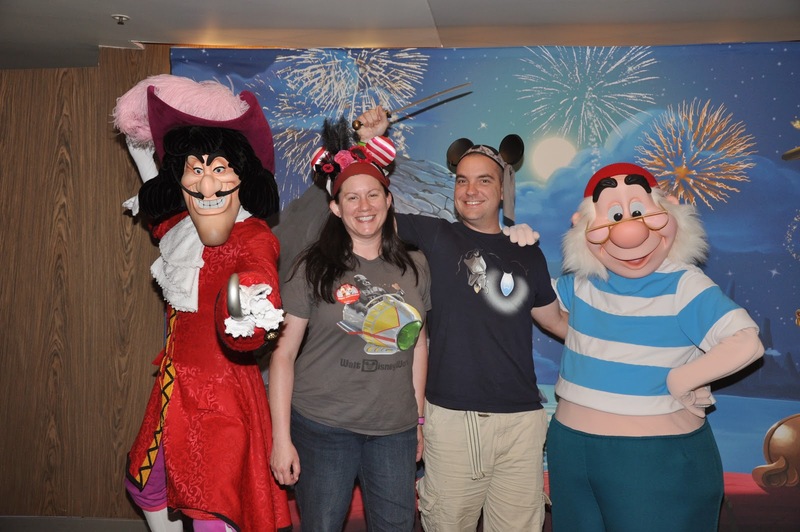 Start with a snack buffet and meet & greet with Captain Hook and Smee at the Contemporary, and then set sail on the Seven Seas Lagoon with Patch the Pirate. It is, hands down, the most I have ever laughed at WDW. 2. If you get a late reservation at Ohana at the Polynesian, they dim the lights and play the soundtrack for Wishes in the restaurant. Your best view of the fireworks is at a window table, of course, but we could still see from table in the middle of the restaurant. We discovered this on the first night of our honeymoon, and it was a magical surprise! 3. NEW! The aforementioned Wishes Fireworks Dessert Party, the new and improved version of the Tomorrowland Terrance Dessert Party, which begins July 5 (reservations open today). This really is one of the best views of Wishes, and they will not even let you hover in this area if you don't have a dessert party ticket. Hollywood Studios has 3 options for Fantasmic VIP Dining, and once you go VIP, you will never go back. The Fantasmic arena is ENORMOUS, accommodating nearly 10,000 people, and the VIP section is so spacious and convenient. We walked right down to the second row (prepare to get wet) and I think I will need VIP seating on all future visits. Hollywood Brown Derby - My personal favorite. The service, food, and atmosphere are top notch. Children are allowed, of course, but this in the "Fine/Signature Dining" category and is a great "date" restaurant. Mama Melrose's Ristorante Italiano - A more family-friendly, cute & casual option with delicious Italian food & wines. This is on my list for our next visit! Hollywood & Vine - Your basic buffet with salad, pasta, and carving station, with kid friendly options like chicken nuggets and mac & cheese. And, of course, a chocolate fountain! "While Rose and Crown cannot guarantee their ability to grant requests for patio tables, hopefuls begin crowding the podium before 7:00PM each night, willing to wait as long as it takes. The line of patrons waiting to check in can stretch all the way to Tudor Lane. As a result, Rose and Crown has instituted a policy (in my experience) that those checking in at the podium may wait only one hour for a table request; after an hour, they must take the table offered, or choose not to dine at Rose and Crown." 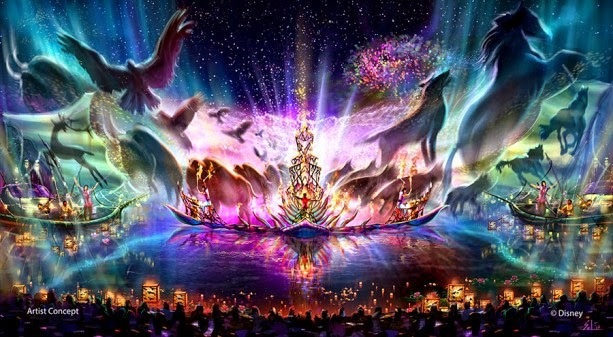 IllumiNations Sparkling Dessert Party - Click the link for the menu of desserts and wines from around the world! Like the Wishes Dessert Party, this VIP area is the best possible view of the show. Tokyo Dining - This is a great indoor viewing option that is similar to the Ohana experience, for when you don't want to arm wrestle for a patio table at Rose & Crown or the other waterside restaurants. We made a late reservation, arrived early, and requested a window. I believe we were seated at our original reservation time, and got a window table! Bonus: This is one of the few places to get sushi at WDW. It's not a huge or adventurous menu, but it's good. What is your favorite evening show viewing experience at Walt Disney World?